“Iron Man 3” is rumored to be the wrap-up of the Iron Man story, which all of us Marvel fans know is likely not true. We know Iron Man will be back in “The Avengers 2,” a movie that runs parallel to the “Iron Man” movies. 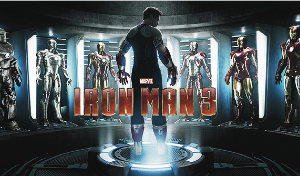 I recently watched “Iron Man 3” when it was released on DVD. The story begins after Tony Stark (IronMan) almost loses his life in an epic battle in “The Avengers.” He is living with Pepper Potts, his lover/assistant, played by Gwyneth Paltrow. The aftermath of the New York battle in “Avengers” has left him suffering with post traumatic stress disorder and having panic attacks. However, Stark has no time for that as he must continue to fight enemies. Overall, the movie could be better but it does shine in certain areas. One is the newest Iron Man suit. Stark uses computer chips implanted in his arms to control the suit — number 42nd in the line of Iron Man suits. I like how that makes it easy for Stark to get in and out of the suit. Another cool part is the final battle when Stark activates his house party protocol, and all of his Iron Man suits fly to him to fight off an army of bad guys. I also like that in this movie, Stark is humanized and even more like-able. And, the CGI in this movie is amazing. The movie also had parts I didn’t care for. This is hard for me to digest as Iron Man is one of my favorite characters in the Marvel universe and Robert Downey Jr. one of my favorite actors. Mostly, I wish they would have kept the same director for the last movie as they did for the other two. Nothing against Shane Black, but you just do not change drivers in the middle of the highway. Now, for a spoiler alert. If you haven’t yet seen the movie, you may want to stop reading. At the end, Stark blows up all of his suits, leading viewers to believe he won’t be back as Iron Man in “The Avengers 2.” However, I believe he will and I think he will already have a few new suits as well.